The Last Supper icon (Mystical Supper icon) is over the royal doors of the iconostasis in most Orthodox churches. In front of this icon, is where the faithful come to receive the Eucharist at the Divine Liturgy. Beyond the icon, in the Altar, is where the Mystery of the Holy Eucharist is celebrated. A remembrance of the Savior who instituted the Sacrament at the Last Supper. 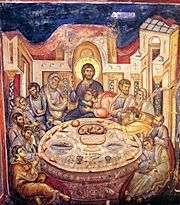 The icon depicts the last meal of Christ with his disciples in the 'Upper Room' before his arrest. 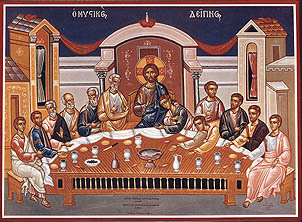 Christ is the central figure at the table. The chalice containing the Precious Blood of Christ is on the table or sometimes being held. Judas Iscariot the Betrayer is depicted dipping into the dish (Matthew 26:20-25). Sometimes an icon of the Communion of Saints in the Kingdom is above the doors on the iconostasis. It is not a depiction of the Last Supper, but the portrayal of the continual and same Eucharist that the faithful are celebrating in the local parish. Judas Iscariot is not depicted, but others saints that were not at the Last Supper and angels may be depicted. This page was last edited on December 12, 2006, at 19:02. This page has been accessed 32,936 times.